My background in making things starts in early childhood. I would fashion swords and weapons from anything around me. If I couldn’t afford it, I would make it. This talent would be a Godsend for my later hobbies, such as historical re-creation (clothing, armor, weapons), metal fabrication and prop design. Strangely, all of these things go hand-in-hand, helping refine each other in the tool box of skills I’ve picked up from one project or another. 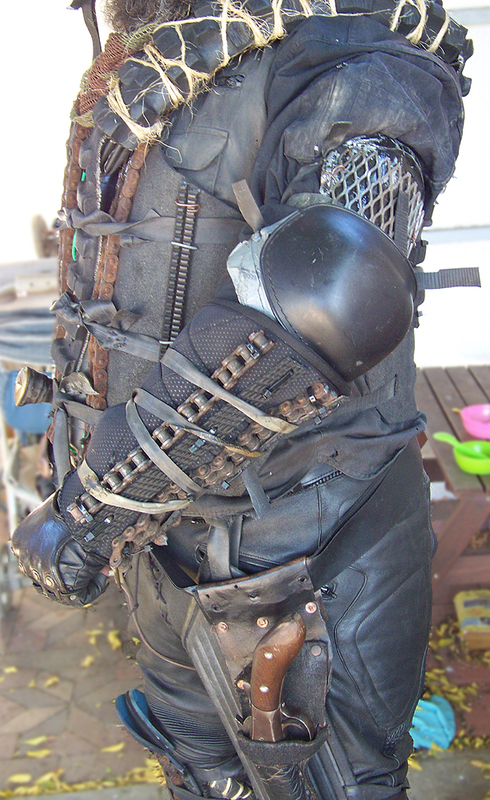 For post-apocalyptic, it’s all about distressing the gear and using everyday things in an unusual way. Many raw materials can be found along side the road or in junk shops or wrecked cars – anywhere people tend to throw out or leave junk around is a potential gold mine of usable goods. When I started Juggers of the Wasteland, we all had to learn how to tell the difference between the salvage worth taking and what we needed to leave behind. Since I am a reenactor and have studied ancient armor designs for 16 years, most of the patterns are based on real armor from periods throughout history – from ancient Jewish tribal armor from the time before Christ, to the 14th-century German breastplate made out of ATV tires. I use these designs because they were designed to work. Many people will go for a look and ignore the details, like ease of movement and coverage of vital areas. These details are what make a costume either functional, or just a costume. Since our Jugger gear is actually used to protect us, it is tested and revised until it works to the user’s preference and doesn’t hinder mobility or fit poorly. These things are crucial for attaining a look of utility. The best way to make a costume visually complex is with textures. By using pre-existing materials with their own texture (e.g. sports pads, rubber place mats, floor paneling), or making texture with materials (e.g. bicycle or motorcycle tires, or even painted patterns on the body of a garment) juxtaposed with conflicting patterns, you create a look of random-acquired things assembled into a whole look. 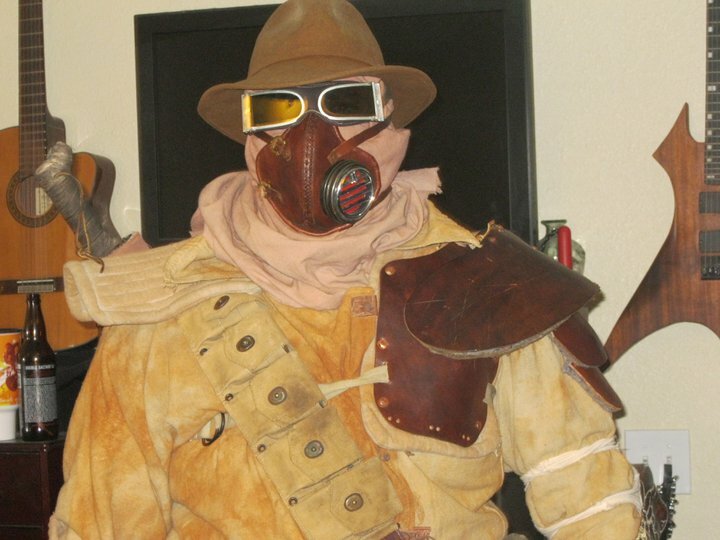 Add this with weathering, and your look will be as unique as you want it to be. The real key to the look is improvisation. So much of the costumes we see as authentic, have the look of age, or being repaired with almost anything: duct tape, zip ties (work great on leather! ), patching, and other methods. These add to the look of desperation that characterizes the aesthetic we so crave in our own fabrications. Most of my design and inspiration comes from the materials that present themselves (and by presenting themselves I mean whatever I can scavenge). 95 percent of the materials used in all of the Jugger armor we make is scavenged from bike shops, Pep Boys, and anything we see out in the world that catches my eye: vehicle floor mats, mud flaps, discarded license plates, and in one case, the fender well from a wrecked big rig! 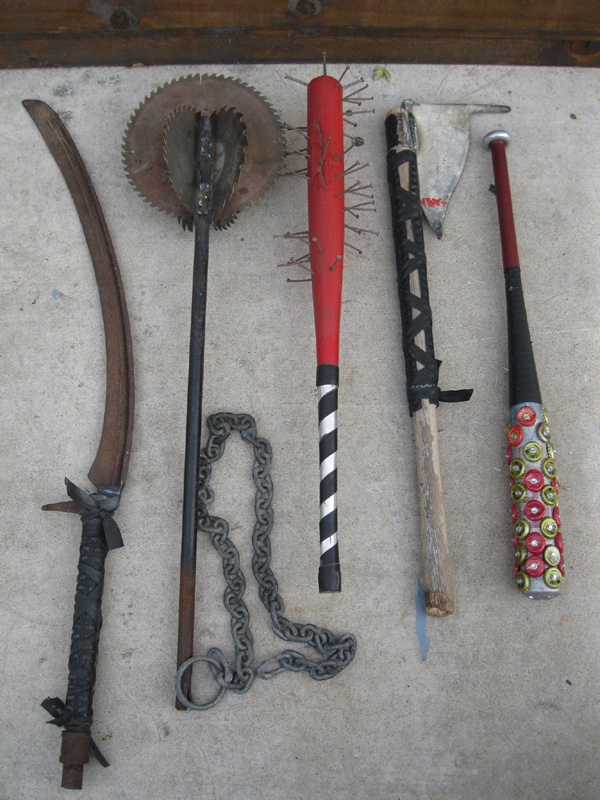 All of these things are usable. Sources for these things are easy to come by (as in mostly free). Here is a short list of places to look during your next raid for supplies. Caution! : Retrieving these things may require dumpster diving. If this is too hard for you, gimme a call and I’ll make your armor for a fair price! Auto parts stores. A good place to find fan belts and other bits in the shop or in the trash (some dumpster diving may be necessary). Motorcycle repair shops. The Holy Grail of all places. A vital source in innertube and many types of non belted tire (special note: they have to pay to have this stuff hauled away so they give it to you for free if you ask nicely). Innertube is essentially the new leather of the wasteland and is so dead useful I could write its own article about its many attributes. Carpet and re-upholstery stores. A vital source of padding and other hard-wearing fabric – more like armor than clothes. Slab City. This is a post-apocalyptic town built on a real military base that was closed in the 50’s. They have a junk yard that is second-to-none. Just wander around and see what you find. Something is bound to be useful! It’s on the southeastern shore of the Salton Sea, outside of Niland, CA. it’s not just a scavenging trip, it’s an adventure all on its own! Keeping one’s eyes open in the world has yielded us many road scores the past few years. Some of us aimlessly wander the highways and trucking routes to find the mud flaps and other discarded parts that come from the constant vibration of the big beasts. Most tire we find on the road is unusable – full of wire and near impossible to cut without a Sawzall or equivalent. But on rare occasions, we find the odd de-laminated tire. This is the result of a factory flaw that causes the tire to fall off the belting and leaves the rubber contact layer intact. We have found only 3 pieces of this. It is rare and quite valuable. Discarded furniture is an excellent source of padding, and in some cases, leather. We have many pieces of “street beast” that are part of our kits and always looking for more. In most cases it’s weathered and beaten to hell, so no need to distress it – less work for a good finish. 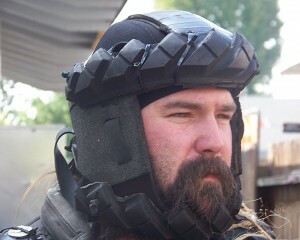 The more random your gear appears, the more realistic it is and the more interesting to be viewed! Just about everyone of my pieces has a story and it’s that kind of appeal that makes this genre so damned fun. So get out in the world and find your gear! It will be waiting for you where you least expect it – unless I find it first! 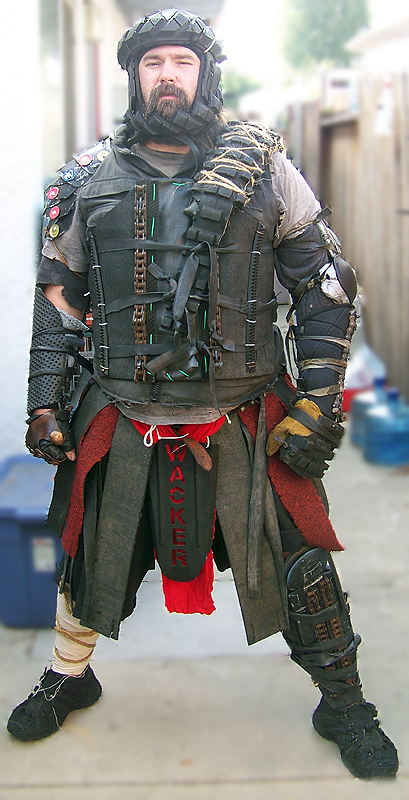 Dan Thompson is the founding member of the Juggers of the Wasteland, is the Sergeant of Arms for Clan MacColin, a 16th century reenactment society, and is the War Leader of the Ravens of Odin Viking-age re-creation society. Dan is also the lead interpreter for the Meyer Art of Combat Study group studying 16th century German swordsmanship and is an apprentice to Peter B Farquhar, hammer master and owner of Authentic Forgeries arms and armory. Dan’s hobbies include welding, prop building, custom leather craft, custom vehicle modification (cars, bikes, etc), weapon and armor fabrication, tailoring and costume fabrication, and he is a rhythm guitarist and Heavy Metal vocalist.